Rocker shaft end plug has 1/2" X 20 thread pitch. 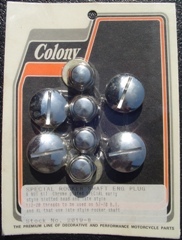 Can be used with all years of Shovelhead and Ironhead Sportsters, but is of special interest to the owners of the early models that came stock with with the slotted end caps who have installed new late model rocker arms with the larger thread pitch. They can retain the stock outer appearance while upgrading the internals to later OEM or aftermarket rocker arms that are available today. Click on Colony Part # above to view larger image.